The Tar Heels (19-2) who improved to an undefeated 8-0 record in the Atlantic Coast Conference, shot 53.7 percent from the floor on 36-of-67 shooting as they continue to lead the ACC in points per game. Johnson, who was collecting his 12th double-double of the year, shot 6-of-13 from the field, while finishing with three steals as well as the hosts picked up from a slow start. “We just didn’t execute the way we should have,” Johnson said of the team’s slow start. “We just have to pay a little more attention to detail and go out there and execute the way we know how to. Joel Berry II added 13 points, six assists and three steals and senior guard Marcus Paige made three 3-pointers and scored 12 points, his highest-scoring outing in five games, while the bench contributed 35 points for North Carolina at Dean E. Smith Center in Chapel Hill. “I got some really good looks, and all of the good looks I got I felt great. I took a couple of bad threes, but you take those away, and I was three for six,” Paige said. Eli Carter led Boston College with 19 points, six rebounds and three assists, but he also had a team-high seven turnovers. As a team, the Eagles (7-14, 0-7) committed 23 total turnovers on the road on their way to losing eight straight games. “I thought defensively, we played hard, just offensively, we turned the ball over,” coach Jim Christian said. “A lot of them were on-ball turnovers, ballhandling turnovers. That was the difference in the game, obviously,” he added. Garland Owens added 14 points, six rebounds and three assists, while A.J. Turner ended with 10 points and seven boards for Boston College, which shot 44.2 percent from the field and remained last in the ACC standings. The Tar Heels, who are averaging 85.8 points per game, the fourth-highest in NCAA DI college basketball this season, also improved to 12-0 at home with the win on Saturday night. The ACC leaders had the advantage on the board — out-rebounding the Eagles 39-23, while out-assisting their conference rivals 23-10. 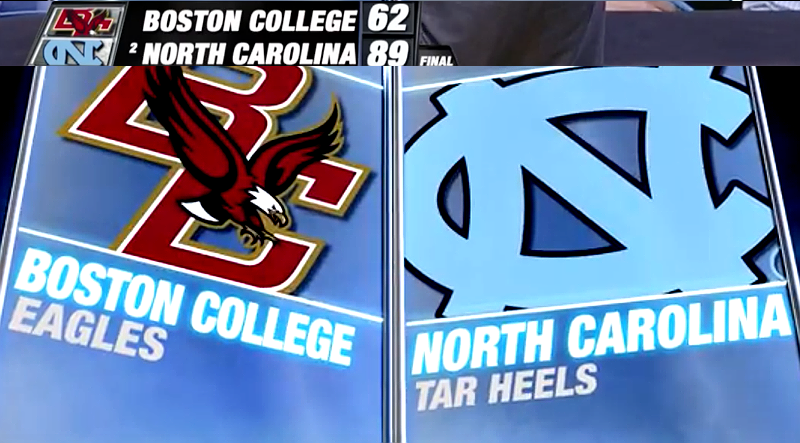 Next time up for Boston College is a trip to the defensive-minded No. 11 Virginia on Wednesday night, while North Carolina also takes the road to take on No. 16 Louisville in Big Monday basketball.